MONCTON : Even after being re-educated to sort wastes into green and blue bags separately, the Moncton homeowners still fail to implement the recycling requirement, as per the reports of Andrew Wort, the RecycleSENB general manager. 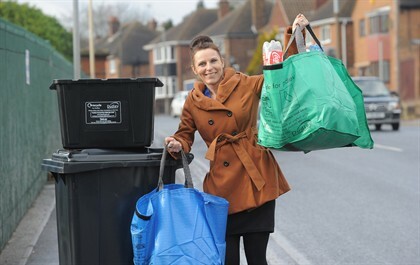 The waste sorting scheme that was being implemented in households and apartments for years requires the wastes to be separated into two bags- the green and the blue one. The green bag refers to soiled and wet wastes that include food items, hygiene products and yard wastes, while the blue bag refers to dry wastes that include carry bags, bottles, recyclable and non-recyclable plastics. The mixing of wet items of the green bag can contaminate the dry items in the blue bag because of which people were being educated to sort their wastes accordingly. The unsorted bags will be slapped with orange sticker and left at the curbside. And if the home owner doesn’t sort it again, they will have to meet with a $100 service fee. Andrew Wort added that the proposed comprehensive solid waste strategy is likely to cover large apartments and businesses too.